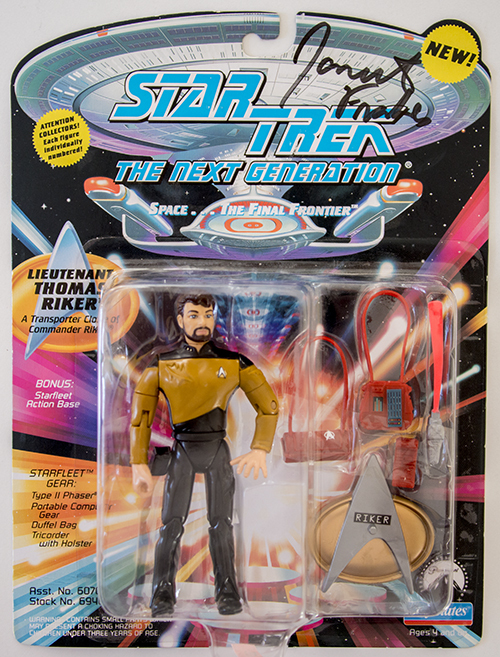 One of my all-time favorite TNG figures: Tom Riker, here on a Canadian card because that's so much cooler. This figure was out of reach for me back when these were new, but I have seen these in collectibles shops, at least once, for $80. That seems like a crazy number now (especially adjusted for 20 years of inflation), and perhaps a little undeserved given the production number for this figure which was 10,000. This one, for example, is numbered 7051. I think what happened early on in the pre-internets days, in those Trek-crazed years, was that some kind of artificial bubble developed for this figure and Esoqq that was quite separate with what happened to Data from Redemption, the other of the top three rares in this wave. Red Data was genuinely rare because it was a JC Penney catalog item that was limited to 5,000 pieces. Curiously enough, it is this figure that is blamed by some for the start of the decline of the whole Star Trek line. Believe it or not, I still haven't seen the actual episode in which this character appears -- for every one time "Second Chances" is aired on TV "Code of Honor" is aired 30 times. This character was brought back in one of the single best DS9 episodes, but at the same time that episode is infamous for an unresolved plotline (along with "Conspiracy" TNG). The crazy thing is that scripts where Thomas Riker would get rescued from Cardassia were actually pitched, but none of them made it to the filming stage. I think the producers may have been afraid that Thomas Riker would once again steal the thunder away from the DS9 cast and the whole concept could become a little silly. I believe the books revisited the character, if I'm not mistaken. But it is a shame that we never saw him after DS9. Thomas Riker as a Maquis falls into one other category of TNG characters that never made it to DS9, Ro Laren as a Maquis never reappeared. I'm sure the writers talked about bringing her back, not in the role of Kira which was originally talked about, but in the various Maquis episodes. And that, once again, never materialized. Here's a rare Canadian-market Lwaxana Troi with card, a figure that is easier to find now with a card than with a pog. The pog-optioned figures were chase figures from day one, so a lot of them were preserved, but the Canadian-carded SkyBox figures were not as rare back in the day. So at this point, an unopened Canadian-carded Troi is not as easy find with a card or pog, even though values still differ greatly. Interestingly enough, this figure is labeled as Ambassador Lwaxana, as opposed to Lwaxana Troi or Ambassador Troi. She really was a Federation ambassador, but the US-market figures didn't really bill this title. Until a couple of years ago I had no idea that this variant with the SkyBox card existed, but it is one of the 1994 figures that Canada received on 7th season cards, whether the characters were from the 7th season or not. (Lwaxana Troi was not; her last appearance was actually in the 4th season, which is rather early). Troi appeared on TNG 6 times and on DS9 3 times, though it feels like there were many many more episodes with her. In DS9 she appeared only very early on. Majel Barrett passed away in 2008. I remember back in the day the comic book shops advertising this figure along with Sarek were asking just stupid money for the pog-optioned figures, $180 in one case. Whether people were paying that is another matter, but in the Trek figure bubble days values like that were thought of as normal. There were a few other Canadian-market figures from the 2nd release that were sold on 7th season cards. Out of all of these, Guinan appears to be the easiest to come by, but that's all relative. When it comes to Canadian-only pog-equipped figures, there were of course also Sarek and Lwaxana -- they're the two best known ones -- and they also came on 7th season boards with SkyBox cards in Canada. But Dathon was not released with a pog in Canada on 7th season board, nor on a 7th season board with a SkyBox card. All photos of Dathon with pog that I've seen show him on the usual 2nd release boards. There are a few more mysteries out there when it comes to rare packaging, true "unicorns" that make Tapestry Picard & company look common. There are still unexplored and unnoticed items out there. As for the figure itselt, Vorgon was a classic, classic weird alien that was made in pretty solid numbers, but was named generically, like the Nausicaan. Esoqq also played this role (though he was given a name) and there were other figures like that starting with the generic Romulan, generic Borg, generic Ferengi, generic Mugato. I'm kinda surprised there was never a generic Klingon. The Vorgons themselves -- there were two of them -- appear only briefly on TNG, and the release of the Vorgon was a lot like the old Galoob figures of Selay and Antican. So people went: what the hell are these about? I have to confess I've never even seen the episode with Selay and Antican, they just don't show it. The weird alien figure subtype was great -- Esoqq and Nausicaan are some of my favorites -- and the Vorgon itself was a bit of a rare figure back when these were new. But speaking of the Vorgon with a pog, I remember these were advertised for like $200 in the mid-1990s. That's a lot of dough, about $250 today adjusted for inflation, and there weren't a lot of them in the states because there was no eBay and the internets were still a newfangled thing. So it was hard to get a real sense for just how many were out here, and trading/selling figures was a slow-moving exercise. Think Homestead and Tripod pages that barely got updated. ::shudders:: Even though figures like that were advertised for those prices, I'm not sure that a lot of them actually traded hands for that much. I mean, I'm sure there were instances of obscene gouging and speculation, but it's hard to wrap one's head around some of those numbers. It was a different time, what can I say. The Borg figures were always a little off in terms of screen accuracy, but the details always made up for that, and that's true of this figure as well. This one has some cool accessories that are, for once, in a plausible color -- this almost never happens, but it happened with this figure. I unironically love the neon accessories from this line. That is indeed a shame that those ideas never really came to fruition; some of the best stories of TNG revolve around Q testing Picard’s mettle. Thanks! We're still discovering new things in this line, surprisingly enough. Yeah, it's interesting that after the first Q episode the writers never revisited it again. DS9 had Ferengi episodes for comic relief instead -- gawd knows there were plenty of those. In hindsight it makes sense. But then Voyager went really heavy on Q episodes. DS9 never had a Borg episodes even though a bunch were pitched by the writing staff, and it had a very minimal amount of space-science episodes (unfortunately mostly as a mechanism for time travel stories). But it did indulge itself in holodeck episodes towards the end of the series, which was a bit controversial -- the whole shtick with Vic and Las Vegas was a little too much of 20th century U.S. culture, as if Star Trek was not Americentric enough. I think DS9 could have pulled off a token Borg episode -- it didn't have to be too fancy. If Enterprise could do it, DS9 could do it. DS9 is also the source of the most obvious recurring characters that were never made, as Playmates kind of gave up on the series halfway through. So we never got Martok, Weyoun, Damar, Eddington, Admiral Ross, the Dominion leader, Breen, etc. Here are a couple of very cool figures that remained enigmas for a lot of collectors for a long time: Vorgon with pog. I remember the asking prices for these being in the $150 range if not more, with the "companion" Dathon/pog figure being valued slightly higher. Back in the day it was really hard to get any kind of intel on these, as all we had were price lists in action figure mags that just listed arbitrary prices, so it was difficult to get a sense for why these were so rare to begin with. Here's an oldie but a goodie: Generations Scotty on Canadian card. This one is numbered #34,879. Back in the day when these were new I didn't see my first one till the summer of 1997, quite a while after this whole lineup was released, and for a serious price at a collectibles store. The three original movie uniform figures plus spacesuit Kirk were snapped up by collectors and scalpers upon release, and so the three original cast members from that lineup were often listed for $40 in price guides and in stores. 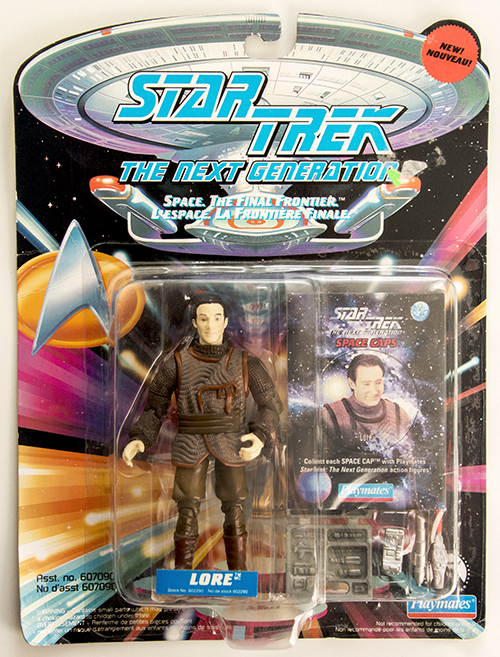 The very first Generations Scotty figure that I saw, as I recall, had a pricetag in that forbidding range. All the while, the rest of the Generations figures (minus B'Etor) were readily on store shelves for a good couple of years, but I did not see a single original cast figure in regular stores ever! And I was actually looking every week. That's how crazy things were. Perhaps it was the typical mid-90s hype over original Star Trek characters: This is gonna be the last time they're in a film, so you better get down to Toys R Us and just clear out your wallet for every one you see. Interestingly enough, Canadian-carded figures (aside from Sarek and Troi pogs) were not a thing in the US at the time, so at least there wasn't something even more expensive to hunt for. Things have calmed down quite a bit since, but it's curious to note that the later Movies lineup did not really revisit these uniforms so we never got a movies uniform Spock, McCoy, Uhura, or Sulu. Playmates busied itself with the unfortunate The Motion Picture pajamas, so very needed movies uniform figures were just never produced. The excellent Saavik figure is the major exception in that lineup, but the whole movies lineup fell a little flat despite some good sculpts here and there. This remains the biggest missed opportunity of the whole lineup: The original characters in Wrath of Khan uniforms. And the lack of a movies-era Enterprise ship model. You would think they produced it, but they didn't. Just let that wash over you for a couple of minutes. Here's a very rare figure that commanded a lot of money back in the day and is still hard to find: Ambassador Sarek with pog on a Canadian card. About 1,100 copies of this figure are believed to have been produced with pogs, along with Troi with pog and only for Canada, making this one of the true rarities of the day. This one is numbered 001451. The U.S. got these only on the 1995 cards and only with SkyBox cards. While Troi was also offered in Canada on a 7th season pack with a SkyBox card, there was also a Sarek in Canada with a SkyBox card on a 7th season package (but this figure is rarely seen for sale -- there are barely any photos of it out there). It's not as valuable as the pog version per se, but it's still tough to find. There were a large number of these quirks in Canada, including a slew of 2nd release TNG figures on 7th season cards like Vorgon with pog, Lore with pog, Guinan with pog, and a few others. 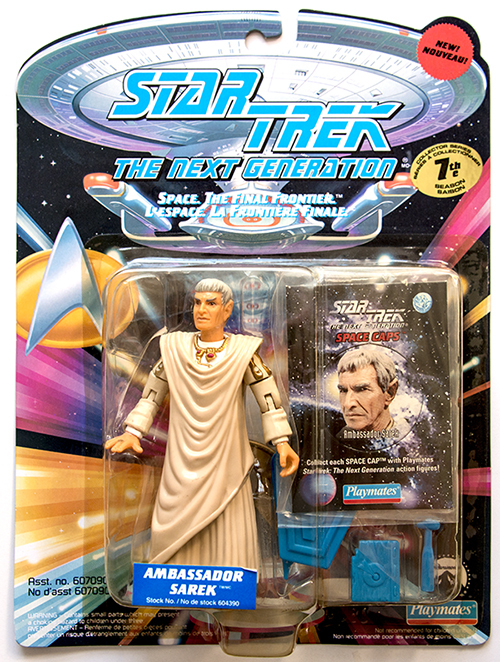 Back in the day Sarek and Troi were advertised for about $200 -- that's what the price guides said in the mid-90s and they were often sold as a pair with the Troi figure for $400. Right now Sarek with pog is between $50 and $80 at the door, if you can find one for sale, and that's a big if. Most collector just have one of these, so it takes some wholesale eBay seller to buy a whole collection and start parting it out to shake one of these loose. So it's not like there is a dozen of these sitting on eBay month after month -- they tend to be snapped up pretty fast. If you think about it, the initial batch of TNG figures contained quite a lot of TOS characters: Ambassador Spock, Sarek, Scotty, Admiral McCoy. Out of all of these, Scotty and McCoy somehow ended up being underpurchased by consumers or overproduced, and ended up being on shelves for a very long time, all the way through like 1996. Ambassador Spock was far tougher to find, especially with a pog, and Sarek went pretty quickly too when he was released in the U.S. with a SkyBox card on the 1995 packages. Here's a Lore figure on the rarer Canadian 7th season card, with pog. This is one of a handful of 2nd release TNG figures with pogs that were also produced just for the Canadian market on TNG 7th season cards. Now, for the U.S. this figure along with Scotty and Admiral McCoy was either overproduced or underpurchased -- it was one of those that could still be reliably found in just about any store that stocked Trek figures, even quite a while after the 1993 lineup's release. I was still seeing figures from that 1993 release on store shelves in 1997. Lore was a bit of a controversial character as viewed the later years, embodying the sci-fi trope of an evil twin. There was also a view out there that Brent Spiner overplayed Lore, who in his first appearance on the series was a bit of an unsubtle, comic book-style, cackling and smirking villain, rubbing his hands together. If you think about it the film "Star Trek: Nemesis" was essentially a replay of the first Lore episode "Datalore" -- another evil android who this time feigns being dumb, but is then more or less turned by the crew, with Data impersonating him to gain an advantage over the Reman villains. Here's a very cool figure, Thomas Riker autographed by Jonathan Frakes. The Thomas Riker figure itself was always pretty rare -- some shops wanted as much as $200 or $250 back in the day -- and even though I have a few of these now this is the only autographed one. The figure itself is one of my top 10 faves from the whole line, so it was a big deal to find an autographed one. If you haven't seen the episode here's the plot in a nutshell: The Enterprise visits a planet that Will Riker visited years ago on a mission on his prior ship, and they discover that a transporter duplicate had been accidentally created through a transporter snafu. So one Riker remained down on the planet, unbeknownst to the crew of the ship, while another Riker beamed up and didn't know that that had happened. The Riker that stayed down on the planet takes on the name Thomas and joins another ship. Tom Riker later came back in one of the highest-rated DS9 episodes ever, after he had joined the Maquis, and hijacks the Defiant to whup some Cardassians. Frakes is from Bethlehem, Pennsylvania and has an MA from Harvard. Even though he is best known for TNG in the pop culture universe, he happens to be mostly a director now, having directed several Star Trek Discovery episodes in recent months, but in the last years of TNG he was already directing episodes of several series. He directed First Contact, which is considered to be the best TNG feature film by a long stretch, and he also directed the follow-up Insurrection, which was fine really but certainly not a massive Borg battle. It was a smaller, visually quieter story, let's put it that way. I would have loved to see more TNG films, but I understand why more didn't happen at the time as Insurrection and Nemesis didn't make that much money. Sci-fi itself kind of died off after the peak of the late 1990s. Frakes' TV directing credits are pretty massive, spanning numerous series, and not all of them sci-fi at all. He has directed TV series that I haven't even heard of. But his filmography following the TNG films is a little sparse -- TV directing and film directing are two different things, and very few directors make the crossover really.